The bloodthirsty Picts and their powerful shaman leader Zogar Sag are marching west. Their goal: Conquest. One man stands to oppose them: the mighty Conan! It almost makes you feel sorry for the Pictish hordes . . . 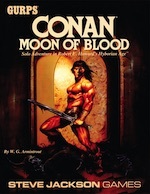 Newly released to e23, GURPS Classic: Conan - Moon of Blood puts you in the role of the savage Cimmerian -- or a hero of your own -- as he faces a threat that will challenge even his renowned abilities. A sequel to GURPS Classic: Conan Beyond Thunder River (which is useful but not essential), this solo adventure can be played time and again without experiencing the same adventure twice. In addition to the NPCs, monsters, and maps you'll encounter in this tale, you'll also get full GURPS details for Conan at age 40. So continue your hero's exploits from GURPS Classic: Conan Beyond Thunder River or enjoy this adventure by itself. How you stop the Picts isn't as important as doing so. Because if Conan can't defeat them, they just might be unstoppable . . .